Darkseid doesn’t understand how skyboxes work. Kyle returns, the fractal armor substituting for his power ring. He makes contact with Batman as the two compare notes. Batman confronts Mike and learns Darkseid was using an old military installation to look into mystic orbs that he hoped would find him the anti-life equation. Now he’s returned to reclaim his forces but Mike, having learned Earth culture from his temporary kidnap victims, tells Batman everything and wants to stay around with his wife and kids. (We won’t go into how a Parademon has a wife and kids mostly because I don’t want to even think about it.) 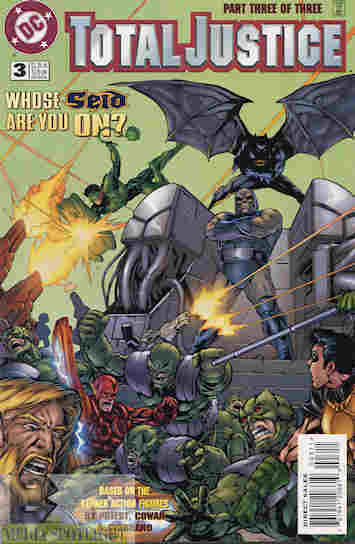 Robin barely escapes Darkseid while Green Lantern reaches Flash and Aquaman, breaking them from their illusions in time to battle and defeat the parademons. The orbs are collected the prisoners freed, leading to a reunion between Tim and his father, while Batman allows Mike and his family to remain hidden on the island with TV and usenet (anyone else remember usenet and newsgroups?). What they got right: For what it is the story has a satisfactory ending. Mike is an interesting idea for folks who know what Parademons are. What they got wrong: My personal tastes versus Priest’s style aside, I don’t think he had a lot to work with. Look, I love my armored heroes and all, but the concept of the fractal armor for the toyline just really didn’t work from a story perspective. Maybe from a play perspective but I didn’t collect the figures. (I know our Friday Night Fight master of ceremonies, Fred of Spacebooger.com, once told me the Blue Beetle figure was one of his favorites when I used this as an entry a few years ago.) Not every superhero needs armor, one of the problems I had with Avengers: United They Stand. (And that show wasn’t very good beyond ideas.) And what reason would they have for needing the armor once they were off the power-stopping island. I’m not surprised, despite what the letters to the editor page claimed, we didn’t get more issues. And this last one has been bugging me all series. The Lantern rings are as much technology as Blue Beetle’s “powers”, which every writer seems to forget. So how did Kyle not have his powers? Recommendation: It’s not a bad enough story for me to recommend avoiding but it’s not a good enough story to recommend picking up. It just didn’t work as well as it wanted to. Posted by ShadowWing Tronix on March 19, 2018 in DC Spotlight, Yesterday's Comics and tagged Aquaman, Batman, Darkseid, DC Comics, DC Universe, Green Lantern, Kyle Rayner, Mike the parademon, Robin, The Flash, Tim Drake, toy adaptation, Wally West.